Interlocking nailing, which has become the method of choice for treating fractures of the femoral and tibial shafts, still lacks ability to provide the important contact-compression at the fracture. An intramedullary compression nail is described, which provides axial compression at the fracture site with tightening of the specially designed distal interlocking screw. This uses the same principle as dynamic compression plating. The study included 11 femoral and tibial nailings performed for various clinical applications such as acute fractures, non-unions and malunions. All the fractures attained radiological union, with good skeletal continuity across the fracture, within an average time of 13 weeks in fresh fractures and 18 weeks in non-unions. Active compression through intramedullary compression nailing has great utility for treating non-unions where it provides greater degree of impaction of its irregular ends. This may prove greatly advantageous to the fracture union through increased stability and the osteogenic potential, particularly when utilized in combination with the small diameter unreamed nails. 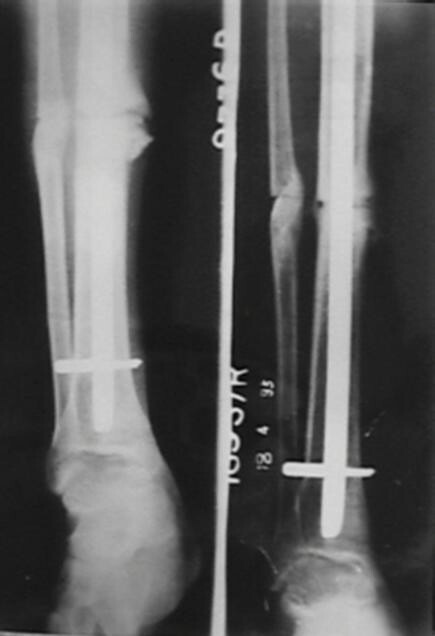 The compression plating was a great advancement in technology for fixation of long bone fractures in the sixties and was the method of choice for nearly two decades. The interlocking nailing which was first described by Modney  in 1953, has undergone many design modifications since then and has almost completely replaced the plating in the present day. It offers a load bearing-device with excellent stability against the axial and rotational deformation of the fracture. It involves much less surgical exposure and therefore the reduced risk of infection. However, it fails to create the contact compression at the fracture surfaces, which is a desirable physiological stimulus to fracture union providing a distinct advantage to the compression plating. The AO nail with an oval proximal hole provides the dynamic locking and is able to overcome the said deficiency  to some extent but it relies on muscular forces and the weight bearing for the compression, with no inherent compression of the device itself. The special interest in compression nailing started in the 1970s in an effort to combine the advantage of compression osteosynthesis to the nailings. 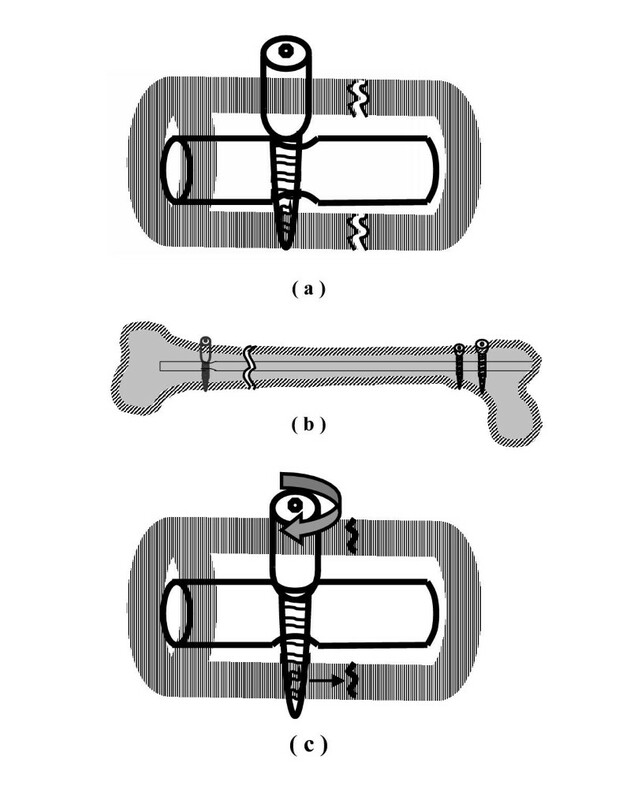 The telescopic locking nail  and the intramedullary compression nail [4–6] described to provide a reliable, innovative intramedullary nailing technique of the third generation, provide active compression of the fracture surfaces. They have proved to have excellent usefulness in not only managing the acute fractures but also in many types of revision surgeries like corrective osteotomy, stabilization after pseudoarthrosis resection and arthrodeses. The dynamic compression nail has been devised to produce axial compression at the fracture site through its self-compression locking screw and the oval configuration of the locking hole. To the best of our knowledge, it represents the first intramedullary compression nail providing axial compression without employing any additional implant or the device. The dynamic compression nail is a modified nail where the distal locking hole away from the tip of the nail is made oval and is utilized to achieve compression at the fracture site using the self-compression locking screw. The self-compression locking screw is a self-tapping cortical screw with an extra long screw head. The screws are available in 3.5 and 4.5 mm thread diameter and in thread lengths of 16,20,24,28 and 32 mm. The 3.5 mm diameter screw has a screw head of 6 mm diameter and is used for the 9 and 10 mm diameter nail while the thicker nails require use of the 4.5 mm diameter screw with the screw head diameter of 8 mm. The length of the screw head changes with the thread length of the screw and is available in the corresponding length of the 8,12,16,20 and 24 mm. The nail is introduced in the standard manner. The interlocking is started from the oval distal hole to be followed by the proximal holes and the distal circular hole in the last. An image intensifier is used and a hole is made into both the cortices of the bone and placed eccentrically away from the fracture through the oval locking hole of the nail using 2.5 or the 3.5 mm diameter drill bit depending upon the size of the compression screw. The near cortex of the bone is redrilled to 6 mm or 8 mm corresponding to the diameter of the head of the compression screw required to be used. The length of the screw to be used is measured using the depth gauze so that the screw head either lies flush with the near cortex or remains just 2–3 mm protruded. The compression screw of the desired length and diameter is inserted through this hole till it just engages the far cortex. It is mandatory at this point to reconfirm the proper length and the placement of the compression screw under image intensifier. A proper size screw has whole of its head outside the oval hole of the nail (i.e junction of it's shaft and the read is placed at or outside the wall of the nail) in the medullary canal, while the screw tip is just engaging the far cortex (Fig. 1a). In case part of the screw head is seen within the oval hole, the next longer size of the screw should be used. The nail is attempted to be pulled out using the extractor to ensure complete eccentricity of the compression screw away from the fracture through its oval locking hole. Locking of both the proximal holes is completed. The compression screw is now tightened which forces the spherical screw head to glide down the inclined edge of the oval hole producing proximal migration of the screw along with the bone over the stationary nail generating axial compression at the fracture. Locking of the second distal hole provides static compression locking. Axial compression of fracture using dynamic compression nail. (a) The compression screw is placed eccentrically away from the fracture site through the oval hole of the nail (b) Nail is attempted to be pulled out to ensure eccentric placement of the screw, proximal locking is completed, (c) tightening of the compression screw forces the spherical screw head to glide down the sloping edge of the oval hole resulting into the axial compression and stable fixation. This study comprised of 11 patients with dynamic compression nailing. There were 3 female and 8 male patients. There were 4 femoral fractures, which included 3 supracondylar fractures and one mid-shaft non-union. The patient with tibial nailing included 4 fresh fractures, 2 nonunions and 1 mal-union, which underwent anterior wedge resection corrective osteotomy (Fig. 2). Six patients had closed interlocking nailing, including the three patients with non-union. The remaining 5 patients had open nailing done. (a) Immediate post-operative radiograph-dynamic compression nailing has been performed after an anterior wedge resection and corrective osteotomy for a grossly malunited tibial shaft fracture, (b) six weeks post-operative radiograph showing early union. Fracture was considered united radiologically when it showed good quality bridging callus all around in both the views. The average union time in fresh fractures was 13 weeks with a range of 11–16 weeks and was 18 weeks with a range of 15–20 weeks in non-unions. Compression could not be achieved in one patient for technical error. The tip of the compression screw got disengaged from the far cortex while attempting to pull out the nail to ensure eccentric placement of the screw through nail's oval hole. The proximal locking was performed without realizing that the compression screw was lying tilted. The locking of the compression screw could only be performed after making another hole in the far cortex. There were no infections. The mean follow-up period was 14 months. Key  was first to describe the use of axial compression in promoting the fracture union. Pauwels  defined and applied the tension band principle in fixation of fractures and nonunions, which also produced compressive forces at the fracture surfaces. Eggers  showed that the contact-compression factor was important in healing of the fracture and described his slotted plate. The compression osteosynthesis has undergone many modifications since then , though it has been mostly in form of plating. The interlocking nailing, which has become the method of choice now a days for the treatment of fractures of femoral and tibial shafts, still lacks ability to provide the important contact-compression at the fracture. The intramedullary compression nail, having incorporated benefits of all the previous treatment modalities appears to be the ideal and the perfect answer to the treatment of the long bone fractures. The initial compression nail had a tie rod placed within a kutschner nail, which was anchored to the distal fracture fragment by cross pinning. An external system was used to achieve compression that was maintained by a collar locker with a setscrew . The later modifications included telescopinc locking nails  and the nails employing an axially inserted compression screw as the compression device [5, 6]. The dynamic compression nail is a further improvement and is able to obtain the desired axial compression without adding any extra surgical procedure, device or the implant and therefore with no added weak spots in the system. The initial authors utilized the compression nail for acute fractures only [10, 11], the main advantage being described as greater stability during the first postoperative weeks. This added stability becomes all the more relevant today with the advent of small diameter un-reamed nails which have proved advantageous in maintaining the endosteal blood supply for improved fracture healing, decreasing many complications of the reaming like adult respiratory distress syndrome or multiple organ failure etc and of course for treating open fractures for the reduced risk of infection. Another advantage of applying axial compression in un-reamed nailing is to eliminate the occasional distraction at the fracture site due to endosteal resistance during the nail insertion . The dynamic compression nail is extremely useful in fixing proximal or distal shaft fractures that may not have very rigid fixation with interlocking nailing alone due to its poor intramedullary hold in such fractures. The recent studies have enlarged the range of indications treated by compression nailing to many other procedures including corrective osteotomies, stabilization after pseudoarthrosis resection and readaptation of the resection sites in arthrodeses with excellent results [3, 6]. Our study confirms the role of the compression nailing for the various described indications.The dynamic compression nail, being almost similar to the standard interlocking nail can be used for routine fixation of all fractures in the non-compressions mode using the ordinary screws. It has an advantage of providing operating surgeon with a choice to be able to change to the compression mode any time merely by changing the type of screw used to the compression screw. Intramedullary compression nailing's active compression doubtlessly contributes increased stability and enhanced osteogenic potential to the fracture union. This proves particularly advantageous when fixing proximal or distal shaft fractures or using the small diameter un-reamed nails. It also has great utility for treating non-unions where it provides greater degree of impaction of its irregular ends and thus effectively attains improvement of the historical objective.